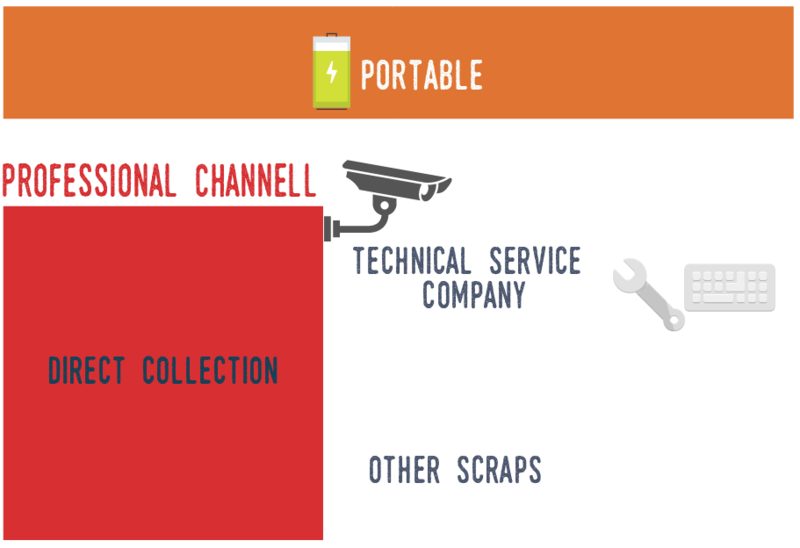 Waste from portable batteries is also collected at decontamination or WEEE treatment plants, as well as from other managers. These collections are carried out in more industrial containers with a greater capacity. THE TYPES OF BATTERY WASTE COLLECTED IN THIS CHANNEL VARY IN COMPOSITION. ON AVERAGE, IN THE DOMESTIC CHANNEL, THE PRESENCE OF RECHARGEABLE BATTERIES IS 7% WHILE IN THE PROFESSIONAL CHANNEL IT REACHES 13%. EVEN SO, WE CAN SAY THAT MOST OF THE PORTABLE BATTERIES WE CONSUME ARE SALINE/ALKALINE.